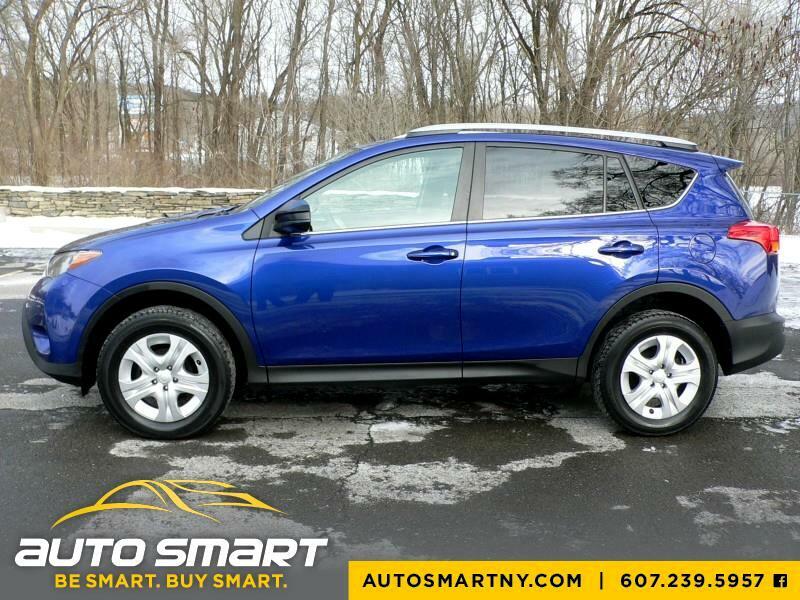 Well here you go everyone, a sleek little Toyota Rav4 for under $17K and with under 70K miles! So many customers call us on a weekly basis looking for this exact vehicle and we found the nicest on the market for all to come see! Introducing a snazzy little 2015 Toyota Rav4 with only 65,000 one owner miles and fully loaded with all standard power amenities! Rocking a dark blue pearl metallic exterior and a black cloth interior this Rav4 is extremely sharp to look at! It has been professionally detailed inside and out giving it that show room new look that it so much deserves! This baby runs and drives like a dream with no issues whatsoever! It has nearly new brakes, excellent tires, a fresh oil change and new inspection! Read what others say about us on Facebook and take the trip to see us so you can win in a big way! "Be Smart -N- Buy Smart" at Auto Smart, LLC! EVERY VEHICLE SOLD AT AUTO SMART, LLC COMES WITH A STANDARD NYS LEMON LAW WARRANTY OF 60 DAYS / 3,000 MILES. WE OFFER EXCEPTIONAL EXTENDED BUMPER TO BUMPER WRAP WARRANTIES FOR AS LITTLE AS $1,200 FOR UP TO AN ADDITIONAL 6 YEARS AND AN ADDITIONAL 80K MILES!